Aloha, Candyfans! E Komo Mai! In the late 1970's, the japanese T.V. 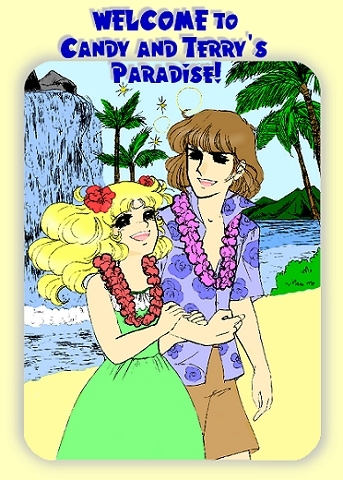 animated series Candy Candy was broadcasted in Hawaii over a period of 3 to 4 years on KIKU, the local japanese channel! At this time, VCRs weren't exactly a home commodity and so fans like myself had to settle by watching all the re-runs, which were shown twice a week! Aside from a couple episodes dubbed in english and released in VHS in the 1980's, this anime televised in Hawaii was the only one subtitled in english! Now, nearly thirty years later, this captivating animation is still remembered and cherished by many fans around the globe! I dedicate this website to all the fans who remember and love Candy Candy written by Kyoko Mizuki and illustrated by Yumiko Igarashi. This endearing and heartwarming story about a cheerful orphan girl who struggled and survived the adversities in life with a smile and courageous spirit, captured the hearts of many fans over the past decade. These webpages are proudly filled with the time, talent and hearts of devoted Candyfans who wish to keep the memory and spirit of Candy alive and burning! My sincerest gratitude and warmest MAHALO to everyone who contributed to this website! Please make yourself at home and enjoy a stroll through this special paradise filled with love and remembrance of Candy and Terry's story and romance! Disclaimer: Fansite created by CandyTerry on June 1999 for entertainment purposes only.